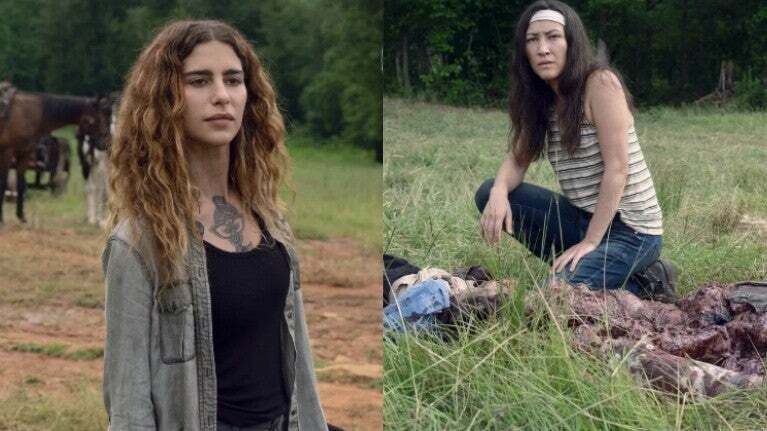 Eleanor Matsuura, who joined The Walking Dead Sunday in the closing moments of Rick Grimes’ (Andrew Lincoln) last episode, has confirmed her Yumiko is in a romantic relationship with group leader Magna (Nadia Hilker). In creator Robert Kirkman’s ongoing comic book series, Yumiko is a Japanese-American survivor who grew close to Magna as part of a tight-knit group of survivors that included Luke and couple Connie and Kelly. Magna, who grew up with what Yumiko called a “bigot father,” kept the relationship secret until Yumiko proudly declared she and Magna were “completely and utterly gay” in The Walking Dead #172. The news didn’t stir friends Michonne, Juanita, Eugene, and Siddiq, the latter two nonchalantly admitting they were already aware of the relationship. The Yumiko-Magna coupling is the latest LGBTQ relationship to reach The Walking Dead: longtime survivor Tara (Alanna Masterson) was first in a relationship with Woodbury’s Alisha (Juliana Harkavy) before later finding love with Alexandrian doctor Denise (Merritt Wever). Single father Aaron (Ross Marquand) was in a relationship with the late Eric (Jordan Woods-Robinson), while Jesus (Tom Payne) remarked he has had boyfriends during a Season Seven conversation with Maggie (Lauren Cohan). Yumiko and Magna will be fully introduced Sunday in 906, “Who Are You Now?,” as the couple and companions Luke (Dan Fogler) and hearing impaired sisters Connie (Lauren Ridloff) and Kelly (Angel Theory) attempt to integrate into Alexandria at the urging of Judith Grimes (Cailey Fleming).